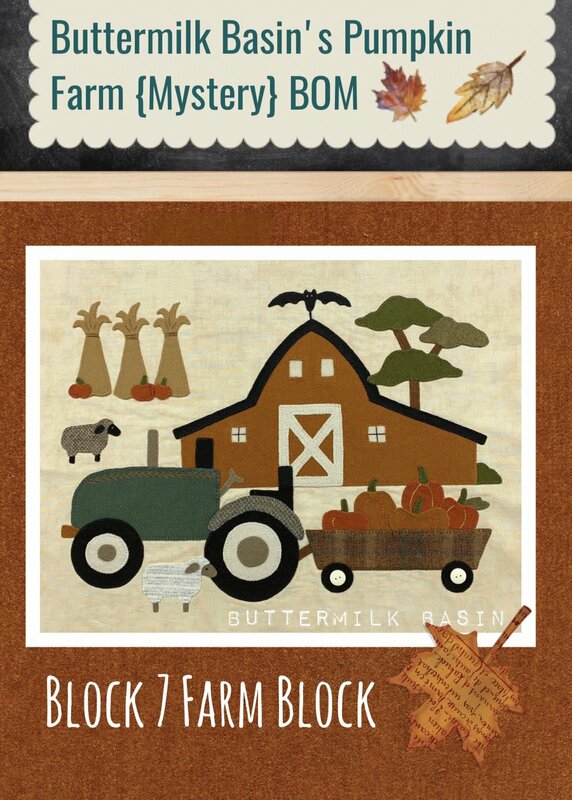 We are super excited to start our EXCLUSIVE “Buttermilk Basin Pumpkin Farm” Mystery Block of the Month with you! 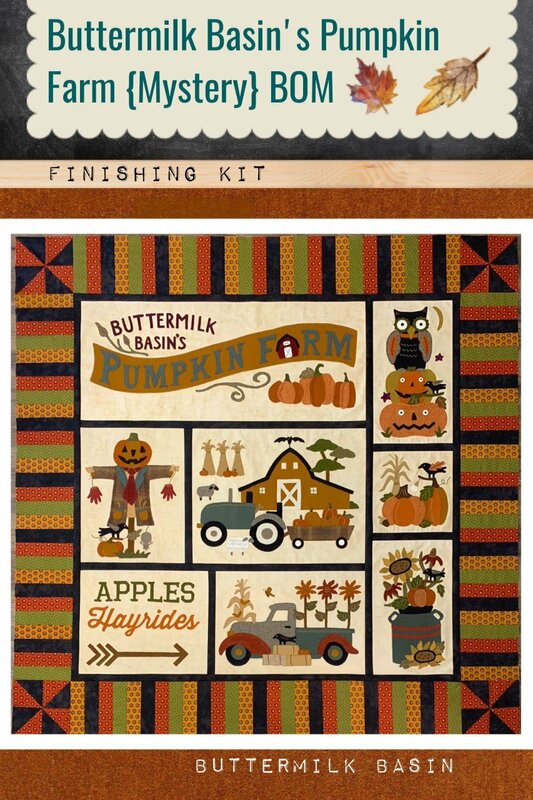 This BOM will feature a cotton fabric backgrounds with wool appliqued fall themed designs! 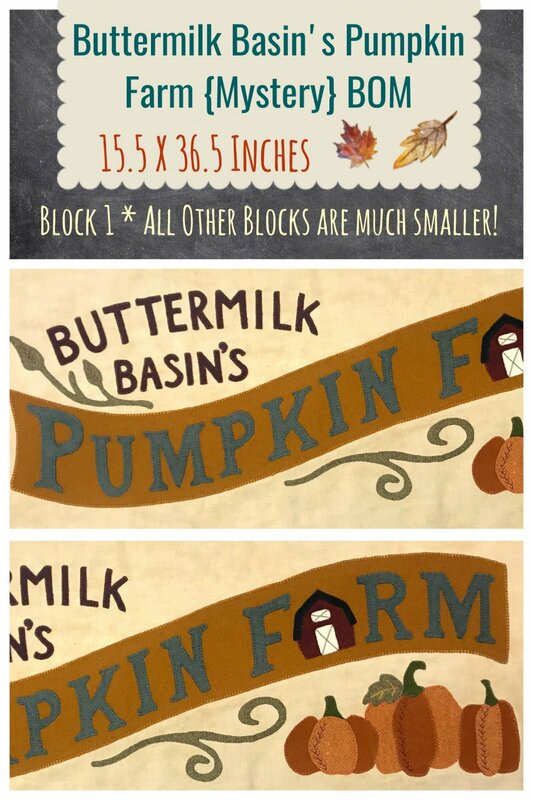 We are kicking it off with the release of our first block welcoming you to our very own BB Pumpkin Farm!!! This block also happens to be the largest block, completing an entire row! The remaining blocks will be much smaller, but will be packed with fall, in all its glory! You can refer to the panel to see a “similar” version of our BOM. This is only a guide for you, as I am switching things up and it will not finish like this. 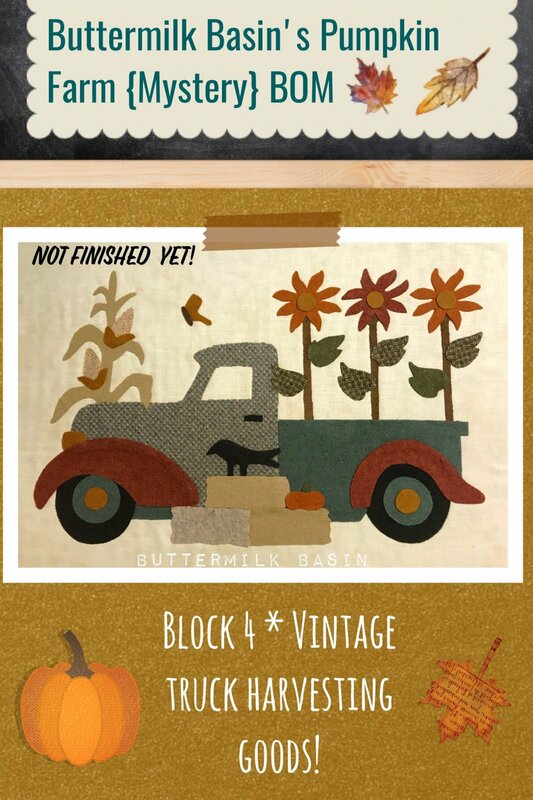 It will, however, have the same warm, vintage fall feel to it and a few blocks will be incorporated! We will be using both the fabrics & wool from the new line too! This will be a perfect opportunity to create with my new fabric & wool line! I know you will LOVE this BOM! AUTOSHIP: YES! We offer this exclusive BOM as a monthly program. All you need to do is call the shop at 763-792-0638 and give them your info! Each month, your next block will be shipped automatically to your mailbox! Yippee! We will be offering this BOM as kits only. Each kit will include the fabric, wool & full colored pattern for each block. Thread kits, buttons packs, finishing kits etc, will also be available! 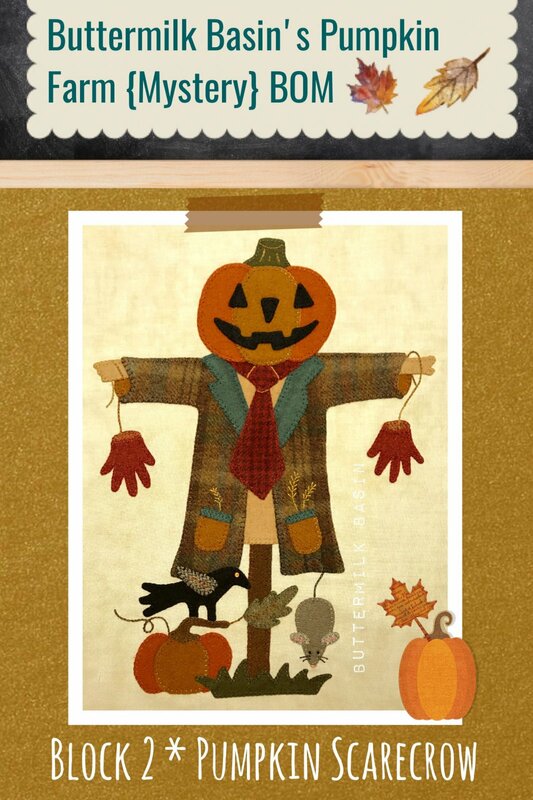 Say hello to the scarecrow of "Buttermilk Basin's Pumpkin Farm" Mystery Block of the Month! He is so handsome in his plaid coat, you will love him! You will receive the pattern, fabric, and wool to complete this block of the quilt. 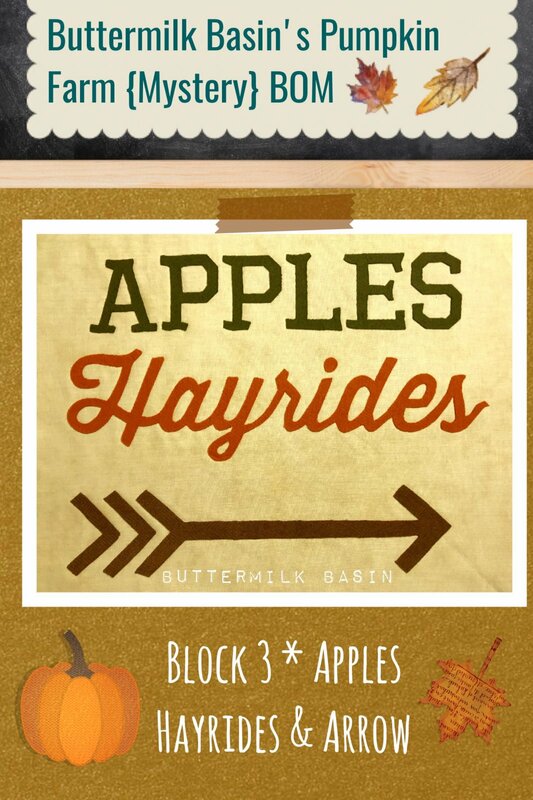 Follow the arrow to Apples and Hayrides in block 3 of Buttermilk Basin's Pumpkin Farm Mystery BOM! You will receive the pattern, fabric, and wool to complete this block of the quilt. This darling old blue truck is our harvesting the goods on the farm! 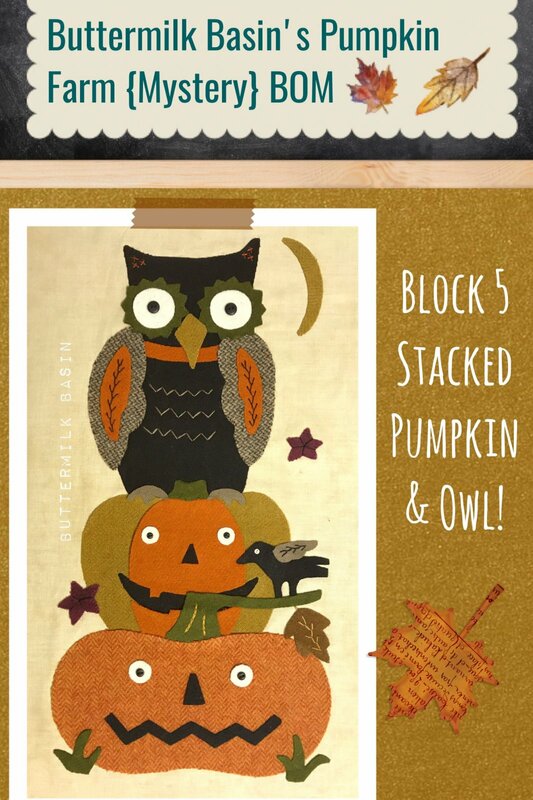 We hope you enjoy block #4 of Buttermilk Basin's Pumpkin Farm Mystery BOM! You will receive the pattern, fabric, and wool to complete this block of the quilt. Of course every farm has carved pumpkins & an owl watching over the farm! 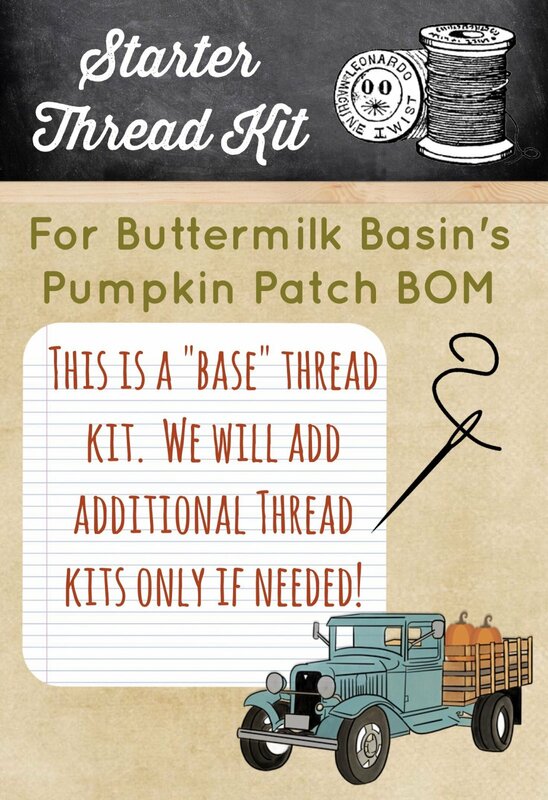 We hope you enjoy block #5of Buttermilk Basin's Pumpkin Farm Mystery BOM! You will receive the pattern, fabric, and wool to complete this block of the quilt. 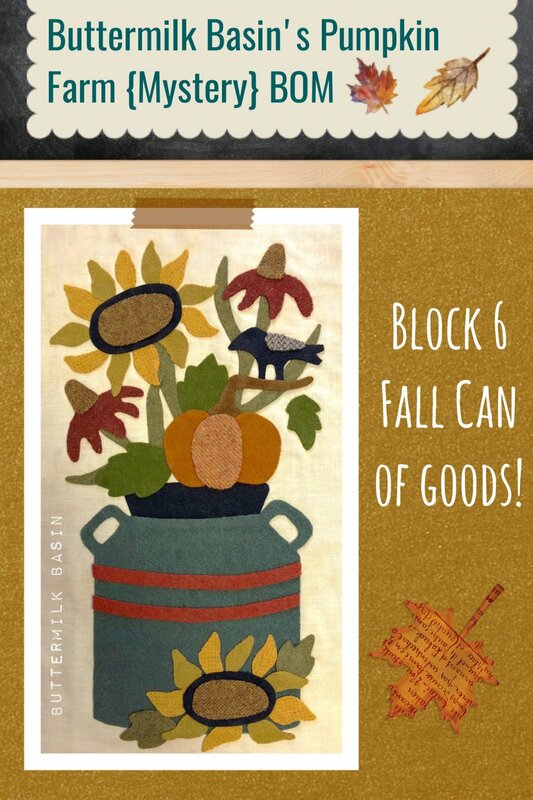 Block 6 of Buttermilk Basin's Pumpkin Farm Mystery BOM features a pretty arrangement of fall flowers in a milk can! The kit contains the pattern, fabric background, and wool to make the block. Block 7 of Buttermilk Basin's Pumpkin Farm Mystery BOM features a great scene at the pumpkin farm! The kit contains the pattern, fabric background, and wool to make the block. 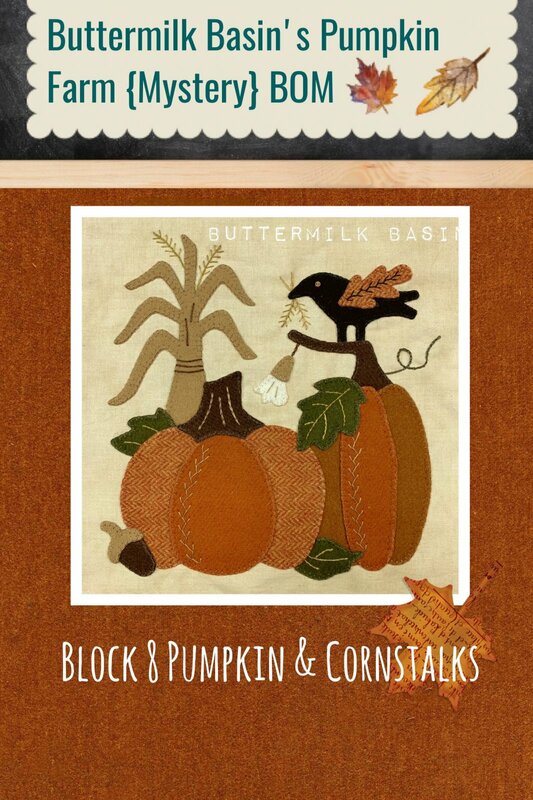 Block 8 of Buttermilk Basin's Pumpkin Farm Mystery BOM is a gorgeous addition to this quilt! The kit contains the pattern, fabric background, and wool to make the block. This thread kit contains 3 various Valdani #12 weight Perle Cotton balls and 2 skeins of hand dyed floss!